Grilled provoleta is good stuff but sometimes it just isn’t enough to satisfy my melted provolone cheese cravings. 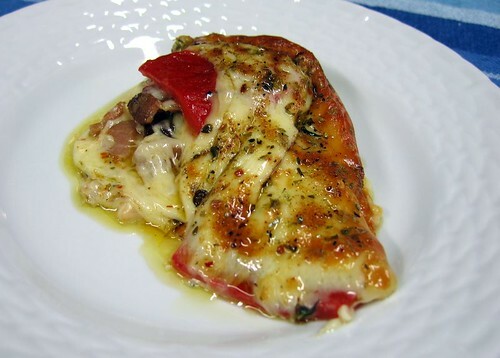 With provoleta rellena, or stuffed provolone, you take two tasty slices of provoleta, add a few things such as roasted red peppers, ham, bacon, tomatoes, etc. in between those slices and heat it all up in a dish until the cheese gets all melted and has a nice crispy exterior. Beth, the commenter, didn’t say what type of bacon was used or if it was browned at all beforehand. I rarely come across any dishes in Argentina, and I don’t know what they do in Uruguay, where bacon is browned until crunchy before use. Although not required for a lot of recipes, there are a few that, depending on how strong the bacon is flavored, would be much more enjoyable if the bacon was browned first. Otherwise, it can get lost in the mix. (Like that sandwich the other day) For this occasion, I decided to brown up some streaky bacon and chop it all up into little pieces. 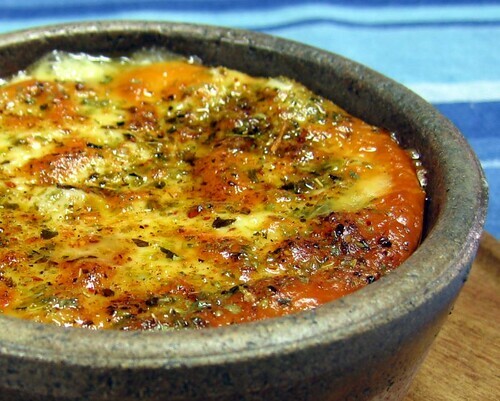 Provoleta rellena is best cooked in a round baking dish that’s just a tiny bit larger in diameter than the slices of cheese. 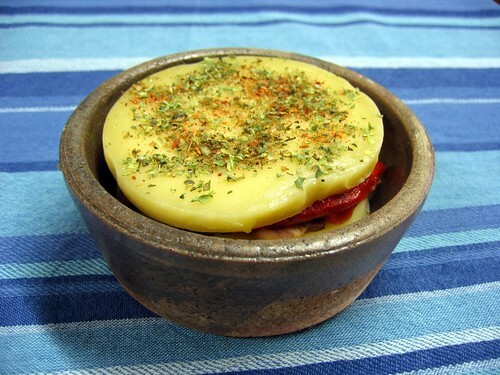 I have these great earthenware dishes, glazed on the inside, that the cheese fits perfectly into. 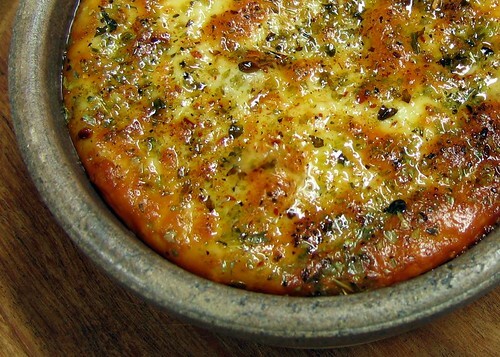 Although the cheese normally gives off enough oil–sometimes more than enough–to prevent sticking, I’ll usually rub the baking dish with a few drops of cooking oil. Into the dish went one 2cm slice of provoleta. Then a one layer each of the chopped bacon and roasted red pepper strips. Decided to leave the ham out this time. Topped all of that off with the other slice of cheese and sprinkled on a mixture of oregano and aji molido. Baking dish set on the bottom of a medium hot oven until the cheese on top was almost fully melted and bubbling at the sides, about 15 minutes. Then, placed under medium hot broiler until the top started to turn golden brown, 30 seconds. The brand of cheese I used this time released much more oil than usual. (see it pooled up in the bottom pic) Other than that, this was fantastic. Bacon & cheese! The sweetness of the roasted red peppers helped to cut the good-sized dose of salt and fat. I did have a bit of a grease hangover shortly after and I only ate about half. Not something that I would eat very often. Maybe a month or two down the road, when I recover, I’ll include ham or play around with some other fillings.